Two 4 Bedroom Villas - Perfect For "3-Generation" Holidays And Big Birthdays! Two spacious 4 bedroom villas, sleeping up to 18 comfortably. The villas share a secure garden (electric gates) which spreads over two acres and includes an enormous gated swimming pool and a tennis court. Despite being surrounded by orange groves and countryside on all sides we are only 10 mins from Vale do Lobo, Quinta do Lago and Vila Sol golf courses and the fantastic local beaches & beach bars. In addition there are many restaurants and bars within walking distance. The setup is ideal for two or more families, or large groups of friends who wish to holiday together - yet have the privacy of their own villa. The villas and gardens lend themselves to large three-generation groups as they allow space for everyone to have their time together and apart. The villas are also very well suited to golf parties. Almancil is just 5 minutes away by car and boasts great supermarkets and shops for all the essentials, and Faro airport is 20 minutes away by car. Villas Jardim are owned Simon & Lynn Dyson who live in Wimbledon. We spent many years on European holidays with our children and finally discovered Portugal when our children were just becoming teenagers. Originally we rented these villas for family holidays for 6 years in the mid-1990s with other families before finally deciding to buy them in late 1999. We then spent a considerable sum renovating the villas but we wanted to keep them as "holiday villas" rather than doing anything over the top! We still spend many weeks each year at the villas with and without our (now grown up) children and grandchildren! The villas are quite unique - they were originally built as part of a planned three-villa complex with a very large swimming pool and tennis court. They are copies of the original villas built at Quinta Do Lago in the 1970s. The third villa was never built and the complex never materialised. We first rented the villas when we needed space for two families plus our friends - and we wanted a tennis court as well as a swimming pool. 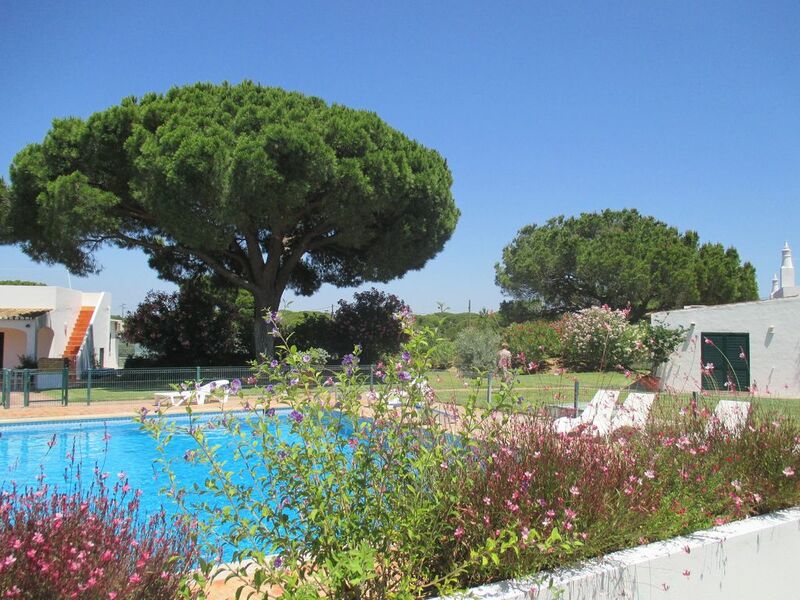 We loved the location - between Almancil and Val do Lobo - and as we are not part of a golf complex it means that we have a great deal of space. Being only 20 mins from Faro airport and 10 mins from all the local golf facilities at Val do Lobo, Quinta Do Lago and Vila Sol is also a huge bonus. The benefits of the villas are obvious - especially for a large group (there are beds for 18): External space: two acres of garden Pool size: 15m x 8m - a huge private pool which could not be built today because of EU size regulations Two villas (each with 4 bedrooms): allows for many combinations (we generally put the kids in one villa and the adults in the other!) External Dining area: we have invested in some splendid large marble-topped tables - seating 18 for dinner is not a problem! Not overlooked: apart from one neighbouring villa, we are surrounded by orange groves - so making a noise over dinner is never a problem and the views of the evening skies in the West are to die for!! We are only 10 mins from the Apolonia - the best privately owned supermarket. En-suite bathroom to master bedroom. En-suite shower room, including lavatory, to twin bedroom. Further bathroom shared between 2 twin bedrooms. Large sitting/dining room with satellite TV. Air conditioning units/heaters in all rooms. WIFI & Sky Sports channels in Villa 2. Very well equipped for large parties and plenty of plastic dishes for children. The patio dining tables (one in each villa) will each seat 12 people easily. Outside storeroom of Villa 2 has selection of inflatables, buckets, spades, rackets, balls etc. Within 10 minutes of Val do Lobo, Quinta da Lago, & Vila Sol, and 20 minutes of Vilamoura golf complexes. We had a very enjoyable stay with the local town very close by but the villa very peaceful and secluded. There were 2 very nice restaurants with in walking distance one inside the garden centre and another Italian. The property was beautifully maintained and definitely to be highly recommended. the property was well equipped and definitely suitable for families with all ages of children. Our extended family of 15 had an amazing holiday in Villas Jardim. The villas are perfect for families and the spacious grounds, fantastic swimming pool and other amenities all contributed to our enjoyment. It is ideally located close to all amenities but is so peaceful that it feels like being out in the countryside. We highly recommend these villas. Perfect for our tennis group! Our group (10 to 15 of us) have been staying here for almost 20 years. It's position is ideal for our tennis holidays, situated close to the various tennis centres. The villas have been extensively upgraded by the present owners and are now extremely comfortable, where we all feel at home. The pool is superb and the large garden allows us all to spread out and enjoy quiet space. We can even do our "homework" on the tennis court! Perfect for a holiday with friends and kids! e spent a fortnight in the villas this June with 3 other families all of which had small babes (0-3yrs). The villas and the grounds could not have been more perfect for us. It was so wonderful not having to say 'no' all day long! The kids could just wander free, run and play without us having to worry, and we could just sit and relax ! And that pool, wow! The location of the villas is also perfect, far enough away from the bustle and noise of Vale do Lobo but only a 5 minute drive to get back there for a day at the beach. We all had such a carefree relaxed holiday that we will definitely be booking it up for next year. Thank you! We spent a week at the villas with three other families - so 8 adults and 12 kids in total - and it was perfect! The villa are perfectly equipped for large groups and the bedrooms/bathrooms are arranged in such a way at either end of the villas that you can get a bit of privacy if you want! The pool is just massive and fantastic for everyone including the little ones who paddle around on the steps (plus it's fenced so it's secure). The tennis court is a bonus, if a little lumpy with a few tree roots, but at our standard it just adds an extra level of interest 😜. Overall a great stay thank you. 15 mins to the local coastal beaches ands beach bars and restaurants. Faro airport is 20 minutes away. Car hire is recommended. Uber works really well and much cheaper than UK. Algar Taxis are our preferred local taxi company and have child seats. Almancil 3 km, Vale do Lobo and Quinta de Lago 3km. There are numerous restaurants within easy walking distance, and the celebrated Apolonia Supermarket 5 minutes away by car. Golf courses, beaches, horse riding, waterslide parks, old Portuguese villages with their daily and weekly markets are all within easy reach. Booking Notes: 25% deposit on booking with balance due 10 weeks before departure. Changeover Day: SATURDAY Arrival after 3pm, departure by 9.45am.